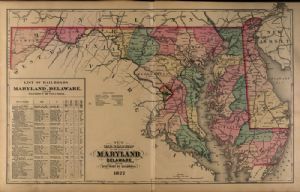 Railroads of Maryland, Delaware and D.C. List of railroads in Maryland, Delaware and the District of Columbia. The map shows completed, narrow gauge, proposed railroads, canals, county towns, railroad stations, towns without railroad stations, railroad names. The map has a copyright of 1876 by O. W. Gray & Son. O. W. Gray & Son.